Remember that beach themed party I mentioned a few weeks ago? Well I wanted to share some photos of the centerpieces we did. We did basically the same thing with just a few tweaks. 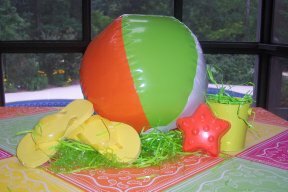 The beach balls I ordered were a lot smaller then I anticipated, but we made them work. Starfish – We had on hand. Smaller Shells – big assortment from the Dollar Store. I bought two. Total Cost for 1: $5.69 a piece. Not too shabby! We also spread fish nets over the table tops to really drive home the beach theme.